When the last of the Kree Accuser Corps, Hala showed up on Spartax to blame Emperor Quill for the destruction of her homeworld and laid waste to the entire planet, Spartax government officials deemed Peter Quill guilty and overthrown him. Even though it wasn't his fault in any way but still, he was in charge of the planet when it happened and that made him a fugitive of Spartax. While other Guardians of the Galaxy members were split in small groups on separate missions, Kitty Pryde and Peter Quill are currently on Xalda-Volta, a Badoon prison-planet. Kitty and Peter are there for an extraction mission but Peter still couldn't let go of the fact that he lost an entire planet, his friends and Kitty too. 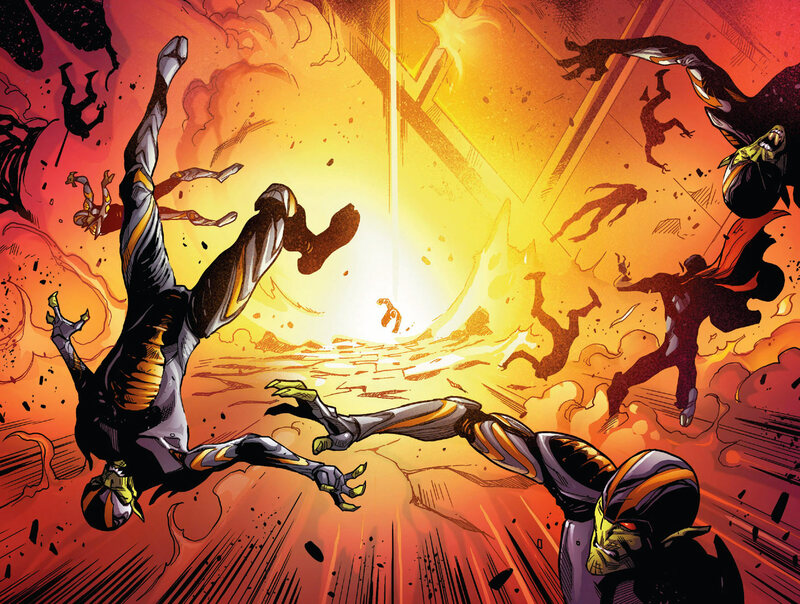 In between hiding from Badoon soldiers and out-flanking them, Kitty unsuccessfully tries to keep Quill's mind on track and they jump into quickly take down a few Badoon soldiers on patrol and then Star-Lord got knocked down by a bigger one. Kitty managed to move him out but more troops were on their tail and while make another run for it, they finally discovered that Xalda-Volta is actually a concentration camp for numerous alien races. Seeing all the deprived alien prisoners locked up there reminded Kitty Pryde of how her own Mutant race was always trampled by others and in a fit of rage, she furiously charges at them with Star-Lord's Element Gun and inflicts heavy damage. She then phase-shifts through a few of their ships to make them crush while Quill frees as much prisoners as possible until he got knocked out by another big one. He woke up in the middle of an arena, sentenced to death while surrounded by Monsters of Badoon on planet Moord; the homeworld of the Brotherhood of Badoon. Captured by Badoon soldiers, Rocket Raccoon was stalling a bunch of Badoons with facts about his prisoner rights, leading them to a spot while The Thing drops on them from orbit, decimating almost all of them at once. After taking down a big-one like a true space-barbarian, Thing and Rocket proceeds to evacuate all the prisoners. Impressed by his unmatched bravery and their attempt to rescue all these alien prisoners Badoon, a female Garonthian approaches him finding herself attracted to Ben. Though, interrupted by more soldiers, Ben and Rocket eventually rescues everyone from the prison planet. Groot and Venom finds themselves among a group of Super-Skrull who are kept here as prisoners, stripped off their shape-shifting ability. 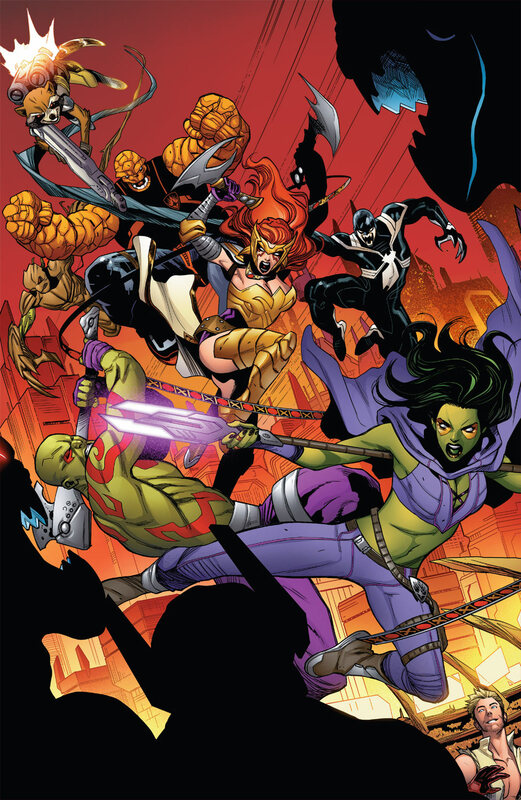 Meanwhile, Drax the Destroyer and Gamora sneaks into Imperial Warden's tower but Gamora got caught and then she unleashes whatever remaining power of The Black Vortex within her one more time to rescue her friend and fellow Guardians of the Galaxy member Angela. When they are all set to go, they have to save Peter Quill from being executed on Planet Moord and then take out Brotherhood of the Badoon for good. Here is your links to buy “Guardians of the Galaxy – Wanted" from Marvel Comics in issues on Amazon. 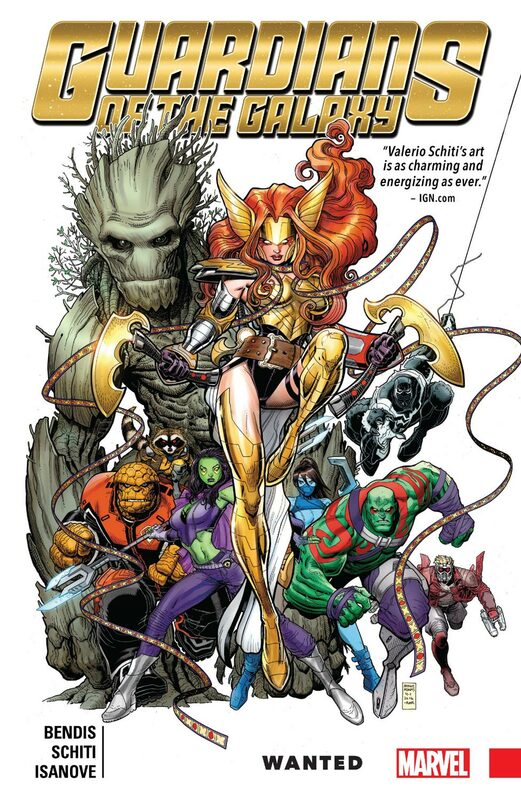 Here is your links to buy “Guardians of the Galaxy – Wanted" from Marvel Comics on Amazon. The second storyline from Marvel Comics' fourth monthly ongoing volume of Guardians of the Galaxy, "Wanted" is comprised of four individual adventures by teamed-up Guardians, leading to one big-finale. Regular writer of the series, Brian Michael Bendis (Daredevil – End of Days, Daredevil – Ninja) and his new collaborating artist Valerio Schiti (Guardians of the Galaxy – Civil War II, New Avengers – A Perfect World) were on the creative wheels, as Arthur Adams (Gen¹³/Generation X, Longshot) was doing covers for all the issues involved. Bendis have started plotting a series of inter-connected stories from "Emperor Quill" and will see an end by the end of the monthly series, drawing a much deserved conclusion. As a new line-up for the team is settled, lot of story build-up process is going on behind the scene and probably leading to a major event. The mission that Kitty Pryde and Peter Quill led eventually freed countless members of different alien races like Brood, Kymellian, Shi'ar and Skrulls. Things are changing as The Badoons are up to a major galactic power play and they are seemingly interested in knowing the current whereabouts of Thanos. The group heads to Earth as Captain Marvel/Carol Danvers asks for their assistance and so, the next story will tie-in with Civil War II crossover event.